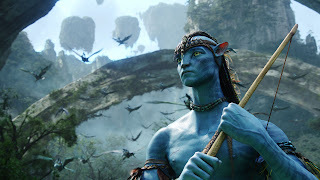 Honestly, I wasn't much looking forward to James Cameron's Avatar. The trailers and clips looked iffy, Cameron's interviews were obnoxious and 3D had never quite worked properly. But on Monday morning I enjoyed virtually every moment of the film, which has gone on to rule the world's box offices much as Titanic did 12 years ago. Not only is the fairly simplistic story thoroughly engaging, but the 3D is utterly gorgeous, concentrating on creating an immersive depth of field rather than gimmicky dizziness. And after 2 hours 42 minutes, I could have watched it all over again. Also last week, we had Jim Carrey and Ewan McGregor in the rather terrific black comedy I Love You Phillip Morris, by the writers of Bad Santa, as well as Miyazaki's latest gorgeously surreal and elusive anime Ponyo and the slightly clunky Thai basketball-meets-kickboxing thriller Fireball. I also finally caught up with three British films: the astounding, unmissable Zimbabwe doc Mugabe and the White African, which plays like a riveting thriller; the excellent doc Afghan Star, about Afghanistan's improbable and rather dangerous version of The X Factor; and the superb low-budget indie Shifty. On Monday, the London Critics' Circle releases the nominations for its 30th Film Awards, and my only screening is a restored version of the 1949 cult classic The Queen of Spades. But I'll also be watching several discs of contenders for other awards (Trucker, Big Fan, The Stoning of Soraya M) as well as other upcoming films (Still Walking, Post Grad, Spread) over the holidays. In a week of big screenings, the capper was a showing of Guy Ritchie's whizzy action version of Sherlock Holmes, which oddly feels more genuine than the more stodgy depictions of the Victorian detective that we're used to. 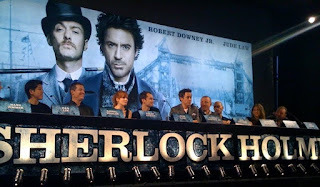 Then on Monday morning I attended the junket at the Freemasons Hall at London's Grand Lodge - a perfect venue - with Ritchie, Robert Downey Jr, Jude Law, Kelly Reilly, Mark Strong, composer Hans Zimmer, and producers Joel Silver, Susan Downey, Lionel Wigram and Dan Lin. Yes, it was another raucous Warner Bros press conference - energetic and great fun. Also screening this week for year-end awards consideration were Peter Jackson's big-budget The Lovely Bones (great acting but too big-budgeted), Rob Marshall's Fellini-based musical Nine (the amazing cast spices up some rather dull songs), Clint Eastwood's Nelson Mandela drama Invictus (gripping and astoundingly inspirational), Meryl Streep in the romantic-triangle comedy It's Complicated (enjoyably funny but nothing special) and Disney's hand-drawn The Princess and the Frog (gloriously beautiful animation and an engaging, simple story). In addition, we had the non-contending Hugh Grant in the rather clunky rom-com Did You Hear About the Morgans? and Chris Pine in the corny post-apocalyptic thriller Carriers. This coming week sees the final puzzle pieces in the awards season as I get ready to vote for the London Critics' Circle Film Awards (deadline Friday) and the Online Film Critics Society Awards (in two weeks). Contenders ready? Here come James Cameron's Avatar, Hayao Miyazaki's Ponyo and the acclaimed British docs Afghan Star and Mugabe and the White African, among several other things I'll catch up with on screener discs. I also have a screening of the Jim Carrey-Ewan McGregor rom-com (based on a true story) I Love You Phillip Morris and something called Firewall. This past week was even slower than I'd expected, as far as press screenings go (it was busier in every other way). And it was interesting that the two biggest films we saw were both remakes of European movies: Jim Sheridan's Brothers, starring Tobey Maguire, Natalie Portman and Jake Gyllenhaal, is a remake of Susanne Bier's Brødre (Denmark, 2004). And Kirk Jones' Everybody's Fine, starring Robert DeNiro, Drew Barrymore and Sam Rockwell, is a revamp of Guiseppe Tornatore's Stanno Tutti Bene (Italy, 1990). It goes without saying that neither remake is quite up to the original. Both are watchable and have moments of real power, with strong performances, but they both magnify the source films' problems and create some new ones. The other two films I watched are both building awards-contention buzz at the moment. Jeff Bridges gets a gift of a role in Crazy Heart, an involving drama that in many ways feels like a revisit to the themes of producer-costar Robert Duvall's 1983 Oscar-winner Tender Mercies. And the riveting documentary Food Inc digs unflinchingly into America's food-production industry, which puts profits over health in some pretty scary ways; it's an intriguing blend of the themes in the drama-doc Fast Food Nation and Michael Moore's recent Capitalism: A Love Story. This week is much busier in the screening room, with Clint Eastwood's South African drama Invictus (talk about a gift of a role for an actor: Morgan Freeman as Nelson Mandela), Peter Jackson's dark drama The Lovely Bones, Robert Downey Jr in Sherlock Holmes, Meryl Streep in It's Complicated, Hugh Grant in Did You Hear About the Morgans?, a stage-full of Oscar winners in the musical Nine, Disney's animated The Princess and the Frog, and the post-apocalyptic road movie Carriers.